J.T.’s Discount Verticals the leader in FULL SERVICE window treatment sales & installations. Providing quality Vertical Blinds to the Staten Island, NY area. 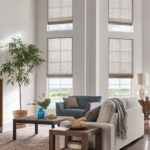 At J.T.’s Discount Verticals or StatenIslandBlinds.com Vertical blinds are a very popular type of window covering in homes and apartments in Staten Island, NY. There are many different kinds of vertical blinds which use a variety of control systems. Verticals blinds consist of several long vertical slats of varied hard material. Vertical Blinds can be made from wood, plastic or metal and are held together by cords that run through the slats of the blinds. Vertical blinds can be opened or closed manually or with a remote control. The blinds are opened by rotating them with the slats spaced out, to a closed where slats overlap to block sunlight and provide privacy. Vertical blinds are made to slide sideways. Their most useful application are on wide windows and sliding glass doors on decks and patios for example. 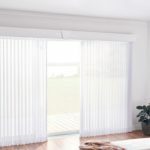 Easy access is one reason vertical blinds are the preference on sliding glass doors. For homes and apartments with wide windows, blinds with wide slats filter more light. The slats on vertical blinds are often 3 1/2 inches wide. Wider slats emit more light when opened, but wide vertical blinds manufactured from wood are sturdier. 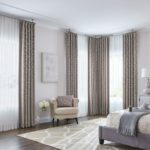 StatenIslandBlinds.com offers a huge selection of vertical blinds that come complete with FREE home shopping, FREE measurements and FREE installation. Serving Staten Island NY for more than 30 Years we have the selection, price and service to make you choice of window coverings one that will make your home comfortable at a price and convenience not offered by online catalogs or big box retailers.